Rebuttal of Guardian's "Egypt: building on sand"
One of the few instances where I took the time to write a point by point rebuttal of a very flawed editorial published in the the Guardian. Lately their editorials have been terribly flawed and have ignored the reporting published in their own paper which is far more accurate and on point. Not all founding fathers are as fondly remembered as America's. The three men who carved up the Soviet Union in Stalin's hunting lodge in Belovezhskaya forest are not today revered as scions of a new order.Egypt's constitution, which appeared to have been passed on Sunday by 64%, has also had a turbulent birth. The result itself came from a low turnout and there were claims of election fraud. The crisis started when Egypt's Islamist president, Mohammed Morsi, awarded himself the power to push through a draft that had not been agreed, prompting a stream of resignations. That's not where the problem started, that's when it became evident. The problem started with the very important promises which Morsi made and broke, such as a new representative constituent assembly and a consensus constitution. He also sidelined all other political forces as well as a great many of his presidential team. He said it was to stop the constitutional court from declaring the whole exercise null and void, but the judiciary revolted as a result. Is what he said enough to do away with very legitimate concerns about the decree? Furthermore it is not only the constituent assembly that he protected but Shura Council as well. He also appointed a biased General Prosecutor. What did he have to say about all of this? up to 2 million Christians voted against the referendum and some leaders called for the president's removal. If this is a victory, it has been a costly one. Now if I knew nothing about Egypt, this would be a very strange way to express what happened after, for starters, which leaders asked for his removal? It was the people on the streets but 'leaders' had only asked him to rescind his declaration before negotiations. If there's something I'm missing about leadership and their calls let me know. Not to mention the 2 million votes from Christians implies that this constitution angered Christians. It could have been to indicate the split in that department but it is ambiguous, paints an incomplete picture and it's shallow. The revolutionary unity seen fleetingly in Tahrir Square has been shattered. How about the new unity found? What unity in Tahrir had been shattered? It was not a result of this declaration but two long years of splits between islamists and all other forces, if anything there was a new unity with people who hardly left their 'couch'. He was accused of behaving like a dictator, not particularly of the military sort, but having legislative and executive powers and putting himself above judiciary oversight is just an accusation? Particularly that he would not back down and hadn't rescinded his decrees but only the 'declaration? but the irony of having won this particular constitutional battle is that he has emerged from it with weaker powers. Morsi the poor martyr, the constitution gives him less powers, leaves him all alone without a vice president and without powers. Sarcasm aside, how is that an honest statement? The problem with Morsi is the control of a group over the country not just particularly himself, where in this editorial does it point to that real problem of the MB guidance council ruling instead of even just Morsi? It is also naive to think that appointments where he signs his name detracts power considering how much pressure he can apply through other powers he has through the constitution. Under the terms of the new constitution, he cannot interfere with any judicial appointment but only sign the names offered to him by the supreme judicial council. His legislative powers revert to the upper house of parliament, the Shura council, pending the elections of the lower house. This is loaded in favour of the Islamists and Mr Morsi will struggle to make it more representative even by nominating more members of the Coptic orthodox, Catholic and Protestant churches to it, as he did on Sunday. But he has promised to put amendments to the controversial articles of the constitution to the first session of parliament, if agreement can be reached between the major political parties. See previous statement about Shura council, the word struggle is true but not in the sense implied by this writer. The statement sounds as though he were not responsible for the situation we're all in. We've seen all the promises of Morsi and the Muslim Brotherhood, they mean nothing. Also ignored is the fact he could have called off the referendum but was more interested in getting passed in any way, breaking the promise of not putting it up for a public referendum without consensus, clearly there wasn't. People didn't even make it to 67% agreement which was the minimum for the constituent assembly, meaning that it wasn't representative, an important point while trying to make it out that Morsi is trying reach an agreement. In his wish to speedily install a new order, Mr Morsi cut corners, at times dangerously. His emergency decree overriding all judicial oversight was cast much too wide. Verbal violence soon became physical after a tent encampment outside the presidential palace was broken up violently. The opposition claimed they were beaten, detained and tortured. The Muslim Brotherhood insist they were shot at hours later. These scenes were a disaster for a president who has vowed to represent not just Islamist Egypt but all Egypt. Who broke it up? Not mentioned, also the opposition claim and the MB insist, fine if you're going to take sides, but at least make it clear that Morsi's MB men called for this break up and their supporters actually executed it, meaning the president and his group were directly responsible, this article makes it out like these events just happened spontaneously. The scenes were prompted by political action, not just an accident like the train hitting the Assuit. This is an important distinction as it is affects the picture painted by this editorial. It's an opinion, but making the facts ambiguous to drive a point is either ignorant or dishonest. The polarisation is not likely to lessen with these results. To be fair that's the one thing in the entire piece that may not be misleading. The church asks their constituency to participate, unsure when they called for no, but even if they did, why is it not mentioned that they were not involved in writing the constitution pulling out after their input was ignored? It's not the duty of the writer to write all the facts, but those that are relevant an help. That aside, it doesn't make sense to single them out as calling for that no vote, even Abdel Monem Abol Fottouh called for it, along with numerous other forces in the country. This in relationship to the next line also seems to push forward the idea put forward by the Muslim Brotherhood that Christians are the main actors behind the opposition. Factually not true, see Alexandria Mosque one week prior and see Imam who was transferred from his post because he refused to support the constitution, this is not just a biased opinion, it's a lie. is a sign of deep tensions. After such a decision, it becomes easier to characterise the polarisation as a religious one. If the facts are untrue, the conclusion is flawed. Such a result might add weight to the view that the conflict was not about an Islamist constitution, but about two very different visions of society: a defined identity-based project to see a more Islamised Egypt; and a more pluralist vision of a democracy, with multiple identities. But the problem is also a practical one. No one behaved as if they wanted to build a pluralist society. Add weight to the view, so flawed information which leads to a flawed conclusion is all to add weight to this idea? Also no one behaved as if they wanted a pluralist society? Liberals have long accepted Article 2 of the constitution? Saying 'no one' is a very weak argument. When you say both sides are wrong, you're covering up for one of them, usually the stronger side. Other sides weren't given a chance. Also remember that El Baradie was inclusive about including the Muslim Brotherhood in the Egyptian Association for change despite everything. The art of compromise was not much in evidence. Mr Morsi started out with the intention of creating a broad tent involving minorities – but that approach also depended on the ability to keep everyone inside that tent. The last few months have made that increasingly difficult. The one hope is that this result encourages both side to fight the parliamentary elections. What is he driving at? Honestly I just don't understand the reasoning, how does polarisation turn into hope through fighting for parliamentary elections. Why is there a message to move on about the constitution despite fraud which the writer himself mentioned and more importantly no consensus? How can a society split up moved past a non consensus constitution with a low turn out and low percentage in favor at that? President Morsi's task is now clear. It is not to entrench the divide but to reach across it to all Egyptians, Christian or Muslim, secular or religious, liberal or conservative. The entire piece ignores Morsi's role in all this.He took measures to divide in the first place as if it were his task, so how is it clear that his task has now changed? Mr Morsi's will have only established a constitution worthy of the name when that happens. Has the writer even read the constitution? The constitution itself helps widen the gap, the Christians he wishes to bring closer were not consulted, the MB have issued statements accusing them of being at the protests and being behind all opposition and the No votes. This is on their official site. The writer can pretend that the constitution articles have nothing to do with it, this is something I can only disagree with and it would be unfair of me to put it in the category of inaccurate facts but rather laziness or poor reasoning. Overall, aside from the factual inaccuracies, unreasonable conclusions and the generally poor quality, this editorial paints a very inaccurate simplistic picture, awfully close to propaganda. So the referendum is obviously rigged, not only are Misr 25 channels announcing the results 3 hours before the polls close, all day there has been consistent reports of violations in favour of the ‘Yes’ vote. Non stamped papers, no anti-fraud ink, people not finding their names, people not being admitted inside the voting stations, judges not present, ballot stuffing, you name it. I won’t. It’s not a surprise at all that this referendum is rigged. The amount of rigging is proportionate to the ‘No’ bias. These many violations and this much rigging indicate that there is a strong effort on the part of the regime to falsify the will of the people. I’ve always said that a regime that does not respect your life will not respect your vote. On December 5, 2012, Morsi the supposed president of Egypt sent his Muslim Brotherhood militia to disperse a peaceful sit-in and then attack protesters using firearms, teargas and he had them set up a torture camp to force confessions. In light of such atrocious measures, one can only conclude that the regime is adamant about getting its way. They see the constitution as a way of attaining their goals. Whatever their goals are, their means doesn’t indicate that it is anything good. Many foreign observers have been devoid of logic, unable to comprehend the referendum or the actions of a vicious regime that sent in vicious brainwashed supporters to uphold an illegitimate decree of an autocratic party. It seems that almost two years of revolution have taught them nothing. They will still make their inaccurate predictions and then claim that Egypt is unpredictable. The answer to the referendum is a resounding ‘No’. Not just because of rigging, and not just because a majority of people have been alienated by Ikhwan’s autocratic policies. It’s because the constitution was not written by Egyptians, it was monopolized by one faction. A rigged constitution does not go a long way. It is as fragile as the parliament rigged by Mubarak’s regime. That’s why parliament was first to go in the revolution. The regime knew it had no legitimacy despite its legality. This constitution is the same, the more forceful they are, the harder they will break. It is impossible now for Ikhwan to rule with stability. There is no reason why people should accept them in power, no saving grace. They are counting on intimidation and pushing forward a false legitimacy, but even Mubarak knew that you need to throw the dog a bone. Egyptians are not dogs anymore though, they are becoming fierce predators who will find a way to take down whoever gets between them and what they think is theirs. When a democratically elected president ignores the will of the people and quickly takes measures to become a dictator, his legitimacy is abrogated. He himself has rejected democracy and the will of the people that chose him. Therefore, if he insists on rejecting democracy, it is well within people's rights to insist that they be heard or have him removed. They would be protecting legitimacy and democracy not turning against it. Imagine Ahmed Shafik had issued that constitutional declaration to clean up the country and uphold the values of the revolution. Imagine he had sent in his thugs to disperse a sit-in and assault women. Imagine he had them use teargas, shotguns, pistols and possibly automatic weapons to prevent protesters from returning to their sit-in. Imagine his goons had sexually assaulted a woman they placed under arrest and tortured men before handing them over to the police. Imagine he had written a horribly flawed constitution that infringes on freedoms and cements military privileges in Egypt. Imagine he had honored Tantawi, Anan and Ganzouri and promised the army and police immunity. Imagine 50 school children were killed during his presidency in a train accident. Imagine he had threatened the entire nation that if they do not vote yes, they will have to live with his dictatorship. Imagine in his speeches he accused opposition of wreaking chaos and of being part of a foreign agenda. Imagine he had broken every promise and made new promises you were certain he was not going to keep. Imagine he had been praised by the US and done everything they needed to appease Israel. Imagine he was a puppet controlled by Mubarak or some other force behind him. Imagine he had the right to label whoever disagreed with him a traitor. Would you still give him a chance to be your dictator? Would you trust him just because you believe him to be a good person? Close your eyes and really imagine, and then talk to me about protecting 'legitimacy'. The recent clashes at the Itihadiyya presidential palace leave little room for confusion. A day prior to these events, people took to the streets in Egypt’s largest cities to denounce the manner in which the Muslim Brotherhood-controlled presidency has been running the country. On Wednesday 5 December, everything changed. The Muslim Brotherhood reacted by calling on supporters of President Mohamed Morsi to march to the Itihadiyya palace, where an anti-Morsi sit-in was ongoing. Morsi’s supporters forced protesters out and destroyed their tents. A little past mid-afternoon all the demonstrators were kicked out and replaced by Morsi’s supporters. In response, anti-Morsi protesters began moving back to the palace area in order to reestablish their sit-in. They started gathering in small numbers at the corner of al-Khalifa al-Ma’moun and El-Merghany Streets. On El-Merghany and stationed around the palace were Morsi’s supporters. Chants were exchanged between the two groups as they faced-off with no barriers separating them. Around 7:00 pm the first clashes took place. As anti-Morsi protesters marched in an attempt to retake the space wherein the sit-in had been forced out earlier, they chanted loudly, “the people want to bring down the regime.” This is when the first clashes began. The protesters that were charging ahead of me turned around and started stampeding a great distance to the back. The retreat was unusual. In other protests people would run for a few seconds and then stop. This retreat covered far more distance. The usual calls of “ithbat” (Arabic for “stay put”), which are often yelled when protests experience attacks, did not seem to work. As I recovered from the run, I realized that the Muslim Brotherhood’s supporters were very close. I saw a young protester shaking his head and telling me, “they are using shotguns.” Then it registered that the big bangs I had been hearing were gunshots. Protesters tried to charge back using what they can of rocks and chanting “Jika” (an activist who was recently killed by security forces in protests around the ministry of interior) and it worked for a few seconds. But then we heard more shotgun rounds fired, and they continued to echo for a great portion of the night. Protesters controlled the intersection for a while, but then the Brotherhood’s supporters pushed them out even farther than last time. It was when we first heard the sounds of an automatic firearm that we were pushed back farthest. Muslim Brotherhood supporters were attacking using rocks, shotguns, blanks, live ammunition, and teargas. Their push split the crowd into three main fronts, one on each side of three intersections, namely al-Khalifa al-Ma’moun Street, Mansheyet El Bakry Street and Roxy Square. Clashes continued in various places. I moved toward al-Khalifa Al-Ma’moun Street. The clashes continued on all fronts with Brotherhood supporters outnumbering protesters, showing signs of strong organization in their attacks, and possession of superior fire power. The Molotov cocktails prepared by anti-Morsi protesters to counter the weaponry used by Muslim Brotherhood supporters were highly ineffective. This is not the first time that Brotherhood supporters have clashed with protesters. One clash had taken place when the Muslim Brotherhood members blocked protesters from the parliament area on 31 January 2012. There was also the time when the MB attacked Popular Current activists in Tahrir Square on 12 October 2012 after they chanted against Morsi. However this is the first time we have seen the Muslim Brotherhood resorting to firearms to attack civilians in an organized fashion. This degree of organization, along with the use of arms, makes these supporters akin to a militia that comes to the aide of the president whenever he is threatened politically. Many protesters were injured with birdshot pellets. Human rights activists who had talked to doctors at Mansheyet El-Bakry hospital told me that two people had died by live bullets. Taking a long route around to Roxy I saw that Central Security Forces (CSF) had blocked access to the intersection. Muslim Brotherhood supporters fought protesters on a side street on the Roxy front. CSF seemed to have protected Brotherhood supporters as they fought protesters on al-Khalifa al-Ma’moun Street and Mansheyet El Bakry. 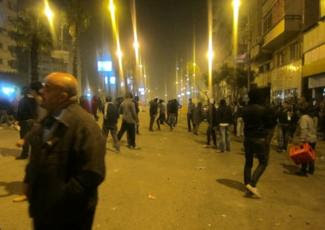 After a while, the clashes were limited exclusively to El-Merghany Street near the presidential palace. An eyewitness who had been on the other side explained to me that as Muslim Brotherhood supporters pulled back, the CSF formed a line to protect them from protesters. When they had fully retreated, the CSF then went behind them. According to the eyewitness, rumors were spreading among the Muslim Brotherhood’s supporters that the church had sent in people to fight them. Meanwhile, teargas was fired at anti-Morsi protesters from behind the Brotherhood’s lines. The police were present on the Brotherhood side of the clashes, but not the other. The show of force, the disregard to opposition and the people, and the strong insistence on monopolizing power are strong indications that Muslim Brotherhood leaders do not intend to lend their ear to anyone but their own. Throughout the night the sound of live bullets, shotguns and fireworks (by protesters) were heard. Clashes continued late into the night. In pre-recorded televised interview, President Mohamed Morsi of Egypt, made an offer to Egyptians similar to the one presented to Willam Wallace by the executioner. Morsi expressed he was not a dictator and that his absolute powers were temporary, will not be abused and that people should trust him. All you need to do is vote ‘yes’ to the constitution, and this nightmare of a constitutional declaration will all be over. 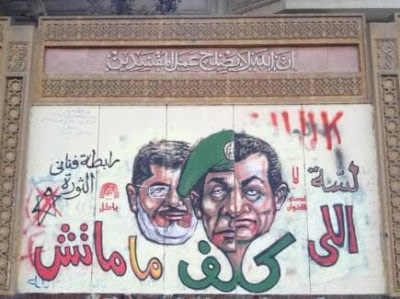 The constitutional declaration, in which Morsi gives himself dictatorial powers and immunized the Constituent Assembly, aims to blackmail Egyptians into accept a flawed constitution that infringes on personal rights and cements military control over Egypt. Despite the two month extension in the declaration for the Constituent Assembly to complete its work, the Constituent Assembly was to finish drafting the constitution in two days. This came after mass protests which the Muslim Brotherhood downplayed a la Mubarak regime. The recent moves by Morsi, the FJP and the Muslim Brotherhood do nothing but muddle the current situation. Speculations arise over why these measures were taken and what happens next. The constitutional declaration stated, “No judicial authority can dissolve the Constituent Assembly or the Shura Council.” However this does not mean that the constitutional court cannot rule on the constitutionality of the Constituent Assembly. The verdict is expected on 2 December. Morsi may have overlooked this loophole much like he underestimated people’s reaction to granting himself all powers unquestioned. If a verdict against the Constituent Assembly is delivered before its work is done, it would mean that the Constituent Assembly is unconstitutional but cannot be dissolved. This race against time could mean that Morsi will call for a referendum on the drafted constitution before 2 December 2012 to pre-empt the court ruling. Talks about protesting this Saturday in Tahrir or elsewhere may well be a diversion. Another reason to rush and call for a referendum is to hamper street movement. The ballot box has been successful in November of last year to end mounting protests against the Supreme Council of Armed Forces (SCAF) and a referendum may produce similar results. Judges may be an obstacle because of their strong opposition against the recent constitutional declaration and lead to a partial strike. However one possibility is that Morsi will bargain with judges and make concessions to the judiciary and perhaps retract parts of the constitutional declaration in return for monitoring the referendum. If they do not accept, the referendum could very well not be monitored. It is important to note that the president’s absolute powers may continue even after the referendum. Morsi may use his powers to target and eliminate major opponents of the Freedom and Justice Party (FJP). Ideally this can be done in the days between voting on the referendum and announcing the results. Once opposition is weakened, FJP can run in ‘free and fair’ elections and once again find ourselves in a perpetually oppressive state. In the unlikely case that people vote ‘No’ for the constitution, Morsi will retain his dictatorial powers and run the gauntlet once again. The question remains whether such a scenario can be achieved. The way the constitution has been written does not reflect the aspirations of the Egyptian people. Many integral forces that represent Egypt are absent including the churches. Sentiments of resentment to the Brotherhood rule are deepening as Morsi’s rule has alienated a broad spectrum of Egyptian society. Protests can escalate to violence and nationwide strikes. But even if the Brotherhood manage to pull off this stunt despite huge opposition, the one thing that is certain is that this constitution will be a stillborn. First published in Counterpunch on 30 November 2012.